Another short vacation post, but with some pretty gorgeous manicures. The first is one I did to celebrate both my birthday and Christmas. I used RA stamp #119, China Glaze's Icicle as the base (which you can't really see), Color Club's Sugarplum Fairy for the amazing glitter, and Black on Black from Sinful Colors as the stamping color. Init purty? The second I did today, and will probably stamp on top of later, but I just couldn't touch Beige Blast (Sally Hansen Insta-Dri) yet. It makes everyone's fingers look elegant, albeit after four coats. It reminded me of Nugget, my little kitten, so I attempted to get a shot with me holding her. This is the best I could do, given her wiggly kitten nature. Finally, here's a little exclusion-ing via Photoshop to highlight that beige beauty. I think your nailbeds are so beautiful and long! 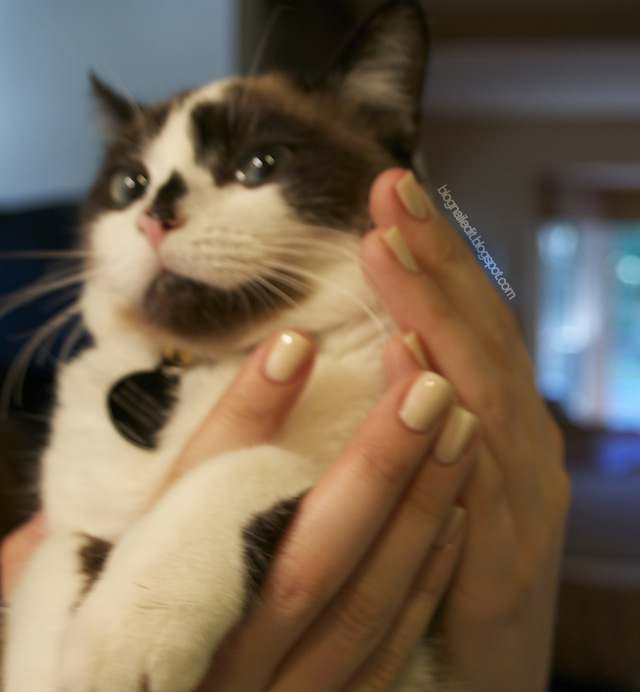 I love your nails and your cat! What a cutie! I love this mani! Your cat is so cute! merry Christmas! Great photos! I love the first photo! 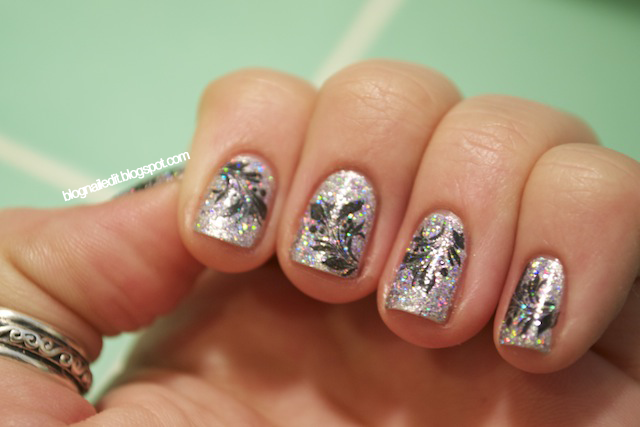 Nice stamping over glitter...and your cat is adorable!